We’re winding down 2014, and it’s been a crazy year in the world of Microsoft virtualization. As I was last year, I’m still waiting for my workplace PC to be replaced by a VDI virtual machine, and I’m pretty sure that a jetpack and flying car won’t be delivered in what remains of 2014. In this article, I will review my predictions for this year. I am a fan of the National Football League, the professional American Football league that dominates the sports world in the USA. Every spring, college players are selected by the professional teams in a process called the draft, and experts immediately weigh in to grade each team’s selections. This grading process is pretty stupid, because no one really knows how these players will work out, and it can take one to three years to really assign a grade. And by then, none of these experts really wants to go back and review their work. Stupid as these predictions may be — they still make for great water cooler conversations. So I thought to myself: why don’t I go back and review my predictions for 2014 and subject myself to some self-grading? Windows Azure Pack (WAP) is the front-end of the private and public cloud offering in the cloud OS, comprised of Windows Server, Hyper-V, and System Center. You’ll also find WAP in Microsoft’s Cloud Platform System (CPS). I believed that it was time for infrastructure consultants and architects to learn WAP. I know a few people who consult on WAP throughout Europe, and they are very busy. I’m pretty sure that their employers might have work for twice as many staff if they could find them. However, the numbers of WAP installations are still pretty small. And the truth is that across all of the brands, most customers still deploy virtualization instead of true private clouds with self-service, measurement, and all the other essential traits of a cloud. I’d give myself a C on this prediction. I’m beginning to wonder if software-defined networking might just be today’s VDI. 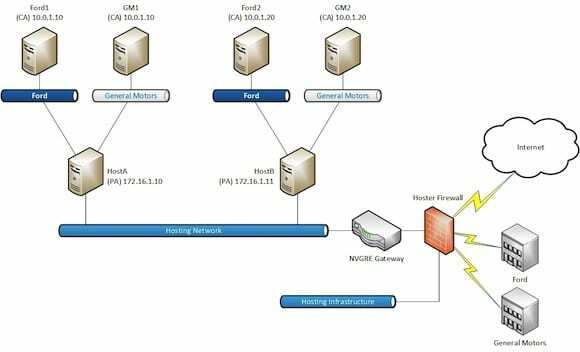 Microsoft’s implementation, Hyper-V Network Virtualization (HNV), is a complicated beast requiring System Center and gateway appliances. 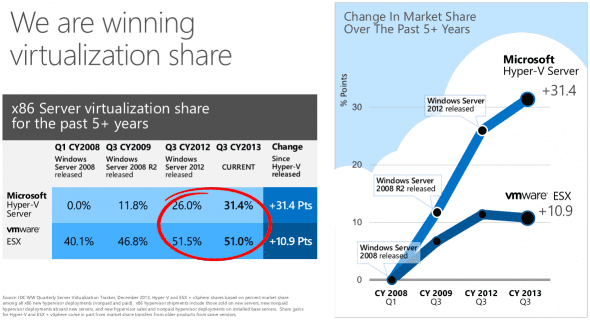 Microsoft has done a lot to increase the flexibility and reduce the costs of HNV in the 2012 R2 generation of Windows Server and System Center, but this is a solution that still is only being adopted by the largest of hosting companies that are deploying Hyper-V. A lot will be done for HNV in the next release of Windows Server in 2015, but I still have to grade myself on 2014. Those same consultants that are busy deploying WAP are often deploying HNV, but not at the same rate. For that reason, I’ll give myself a D.
I’m feeling a bit better about this prediction. It should be pretty clear to most that I am an advocate of software-defined storage. I have been that customer that paid way too much per terabyte in a SAN, both as an on-premises customer and as a hosting services provider. I like the concepts of moving to lower-cost storage that is easier to deploy and automate, so much so, that I convinced my employers to start selling one of the brands involved in this business. I predicted that interest in SOFS would rise in 2014, after a quiet 2012 and 2013. I can say that in my experience, I have done rather well with this prediction. 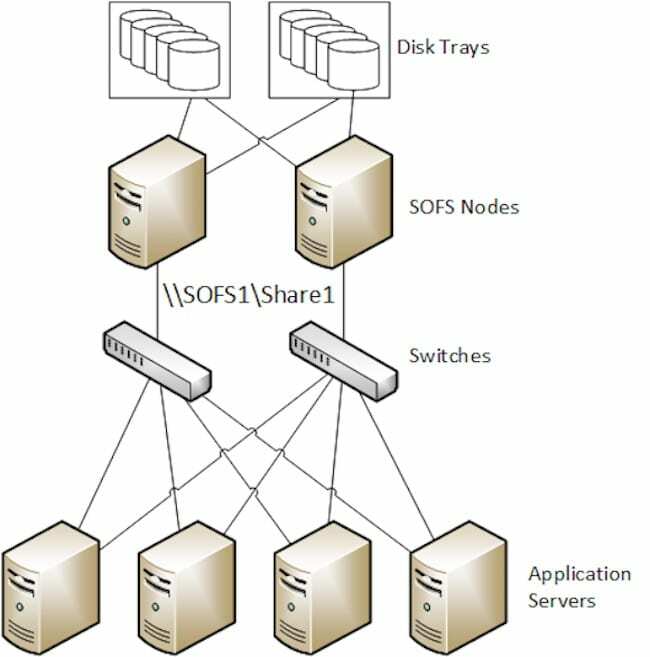 I won’t say that the SAN is dead — far from it — but more and more companies are trying out SOFS for the first time, and I have dealt with a number of companies that have made the choice to switch from traditional block storage from one of the big vendors over to SOFS-based on Windows Server 2012 R2 and third-party ‘just a bunch of disk’ (JBOD) SAS-connected trays. Don’t be that person who thinks, “SOFS is just for small customers.” Some of the kits we have sold have been for over one petabyte of storage in a single footprint in very large organizations. We have also seen cluster-in-a-box unit sales take off, especially for branch office and small businesses. There is still a lot of doubt in our business because people have built up trust in hardware-defined storage over the last 20 years. With that said, that interest exists because of the cost of storing the data becomes more expensive as we continue to generate data at greater levels, where we must retain data for longer than ever before. The biggest obstacles I have seen to software-defined storage has been in the channel. Large name vendors that produce JBOD hardware and partners that sell it prefer to sell higher revenue solutions to their customers. And there is still limited distribution of these solutions from the other manufacturers. Interest has definitely increased, and my employers are seeing this in monetary terms. I’m scoring an A for this prediction! I love RDMA networking, where live migrating virtual machines at 20 Gbps in my lab using SMB Multichannel and SMB Direct makes for jaw-dropping demonstrations. But I really don’t know how many people are making use of RDMA. Although iWARP is simple to configure, it’s very expensive. Also, ROCE and Ifiniband are hard sales to many customers, despite them actually being pretty affordable technologies. Smaller customers rarely go above 1 Gbps (requiring lots of NICs and switch ports) and way too many mid-large customers deploy blade servers with vendor-lockin NICs from companies such as Emulex with awful stability and performance consequences. However, companies such as Mellanox (ROCE and Infiniband) are doing well in large data centers and high performance computing, but few of us ever get to work in those high altitudes. Based purely on public sales figures, which dropped in the last year, I have to give myself a C on this prediction. With that said, I will need to watch this space in the coming year, as I am very confident that this will change in 2015. I was careful with my prediction that this would be the year customers would be doing large-scale V2V migrations from vSphere to Hyper-V; I warned that this could be my “year of VDI albatross in the making.” I was not wrong! Don’t get me wrong; Medium- to large-sized companies are making the switch to Hyper-V. IDC has reported that VMware sales are dropping, while Hyper-V share continues to rise. But this is not always leading to virtualization-to-virtualization conversions, even if Microsoft did release versions 2.0 and 3.0 of the free Microsoft Virtual Machine Converter this year, making it easier than ever to make the jump. Instead, what is happening is that many customers are choosing to maintain existing vSphere installations and bringing in Hyper-V for new installations. This process is less disruptive to critical production systems, and gives those organizations a chance to perfect their Hyper-V deployments, as well as more time to perform the migrations, perhaps in conjunction with application and guest OS upgrades. Although V2V migration are not happening, Hyper-V is continuing to steal market share, so I’ll grade myself with a B on this one. This prediction game is an opportunity for readers to give the ‘experts’ a good ol’ kicking in the comments section (fire ahead! ), so you’d have to ask why anyone would volunteer to inflict this level of embarrassment on themselves. I feel good about my SOFS and V2V predictions. I might have been a year early with RDMA and missed with WAP and HNV. I think I have to give myself an overall grade of C+ with room for improvement. Let’s see what I can come up with for 2015!